Now that it is firmly September I bet you are feeling it. The Summer has drifted away and your Fall activity planning is in full swing. Today is our first day back on a full school/day care/work routine but Fall is hardly done with us. Soon our evening activities will begin to launch. I am watching my September calendar crowd with the busyness I gladly tucked away during the Summer. I can’t help but wonder, How will I Survive the September rush? If you are in the same boat as me don’t worry! 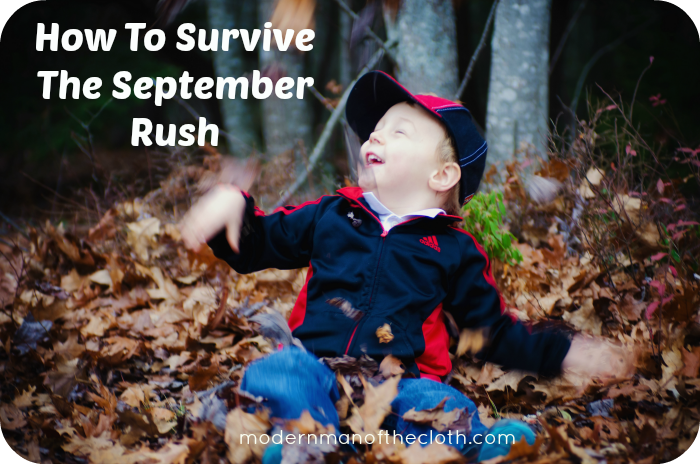 After careful reflection I have a 4 step plan that will guarantee your survival of September, and maybe just maybe it can help you move to thriving in September. Step 1- Accept that you have to layer. This morning I woke up and it was 7c outside (about 46F). By the afternoon it is supposed to make it to 19c (about 66F). I have a choice. Either I can be a tough guy and only dress for the heat or the cold and simply be uncomfortable for the rest of the day. OR I can bite the extra laundry bullet and layer. Everyone of us today is setup for have a mid afternoon wardrobe change. I am trying to convince myself that pretty much makes us movie stars. Step 2- Look at all your old Fall pictures. Last Fall you darted around going a mile a minute to every activity and group you signed up for. You were tired, cranky and ran on pumpkin spiced lattes. But remember that one day where you finally stopped and took some nice family Fall pictures? If you stare at them hard enough and for long enough you can probably convince yourself that last Fall wasn’t ‘busy’ it was filled with fun family activities that created lasting memories. Step 3- Try to focus on only one unrealistic dream per child. We all have dreams for our children. Some of us wish that they will find activities that they enjoy and help them discover that they want out of life. Others of us imagine our children striking it big in the athletic world netting giant salaries and world wide fame. That is fine but if you are going to harbour these wild and fairly unrealistic dreams try to focus in on one activity. I mean even the great Michael Jordan discovered he couldn’t play both basketball AND baseball at a professional level. Your little Jimmy or Janie won’t likely be any different. Bonus Parenting Principle- One last thing. In my line of work being busy and exhausted seems to be a badge of honour to wear instead of a problem to be worked on. I don’t buy that. I think rest and play are too important to be systematically discarded every week. A lot of families seem to operate with that same mentality. It is like people believe if they don’t fill every moment of every day with some kind of activity, program, sport or class that they are somehow losing at parenting. Being exhausted and too busy for a cup of tea should not be the goal you aim for, it should be the problem you fix. I agree! I am learning to say no very well. I was just asked to be room mom by the teacher and while I was flattered, I had to be realistic and said “no”…and I’m quite proud! I am, however, very jealous of your weather. It is still high 80s, low 90s around here. Good for you, saying ‘no’ is a great skill to learn.